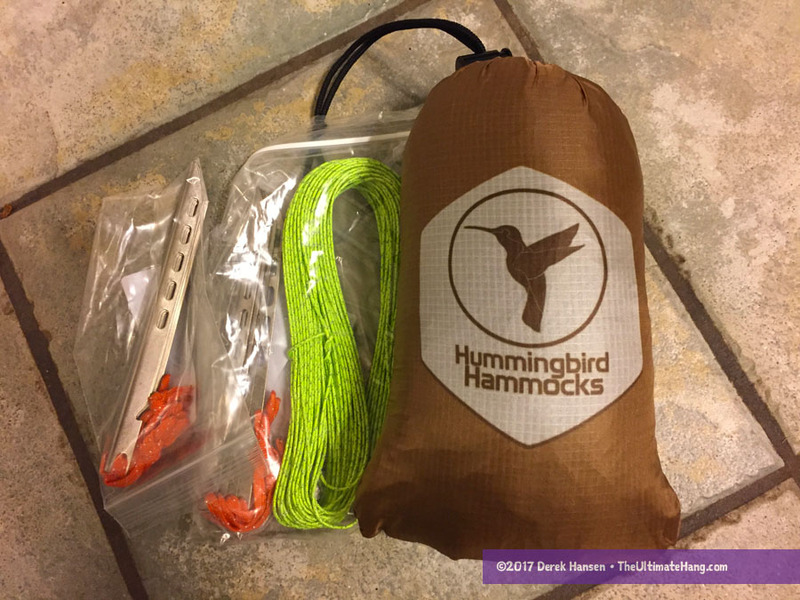 The Hummingbird Hammock Pelican tarp is a winter-style, multi-panel tarp designed for hammocks (and tarp camping). The tarp takes a hex-style tarp but adds “doors” to each panel so all four sides of the tarp can be closed off. The doors can also be opened and pulled back when not in use. The fabric is a new 0.9 oz silicone-impregnated polyester. There are eight side tie-out points (four on each side), and two ridgeline tie-outs. Each tie-out point is reinforced and uses webbing loops as the attachment point. The edges are roll-hemmed to save weight. Four side panel tie-outs are included. 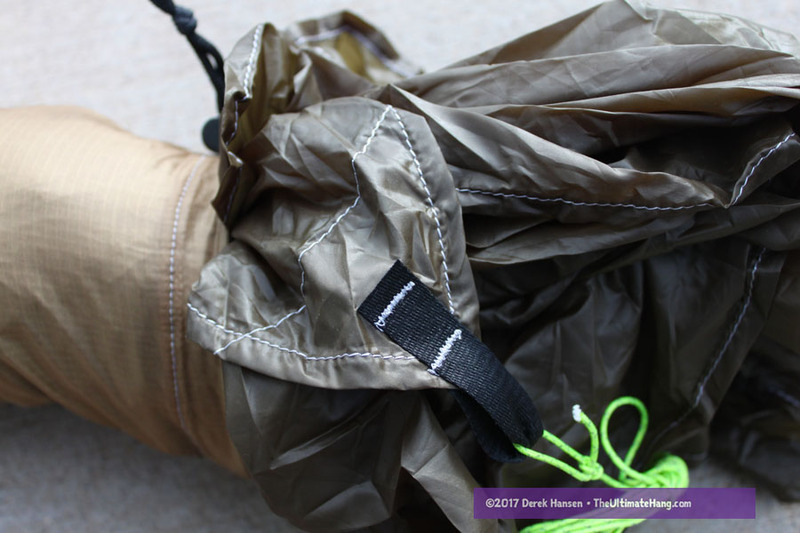 The tarp does not come seam sealed, but can be done for an extra charge. The guyline kit is also sold separately. 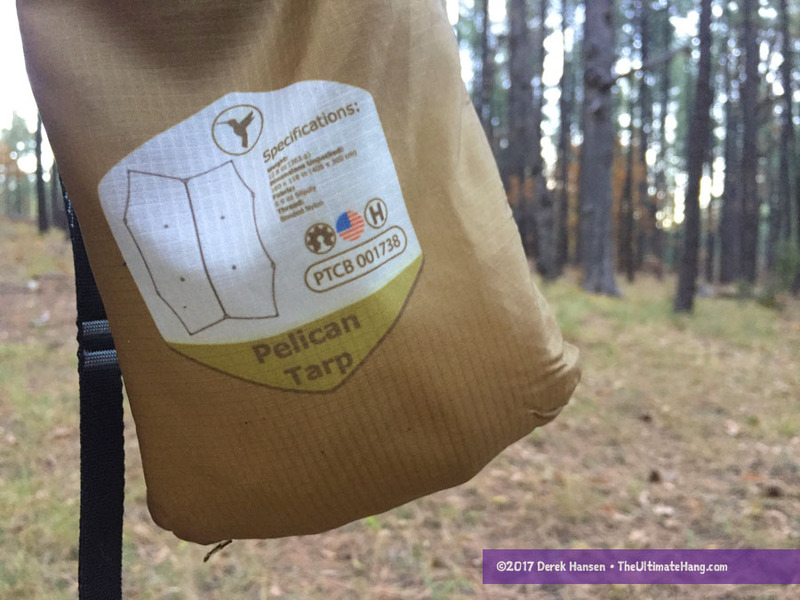 This is the first sil-poly tarp I’ve tested and I was impressed when first opening the package. Sil-poly is a new fabric that boasts a light weight, low bulk, low-stretch, and hydrophobic material. 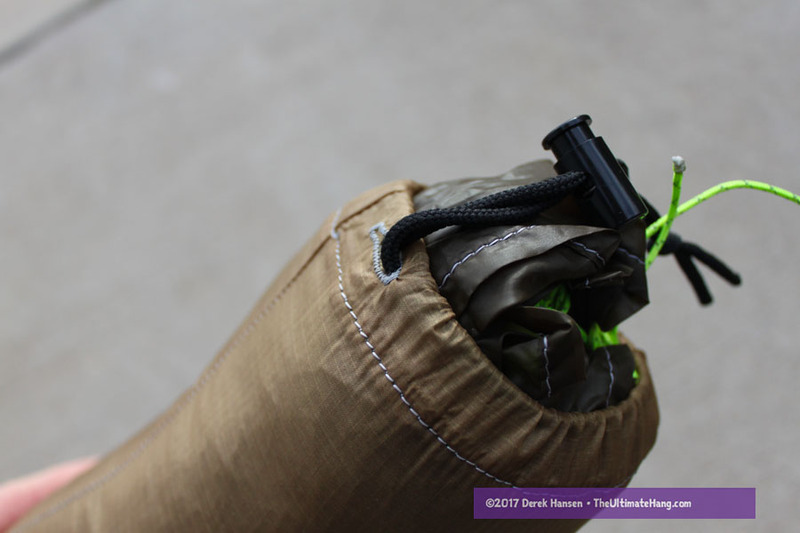 For those of us used to sil-nylon tarps, the low-stretch alone makes this fabric a desired option: no more guyline tensioners or re-tensioning the tie-out points. Polyester is also more UV-resistent and hydrophobic. I love how small I can pack down this tarp (I just stuff it into the included stuff sack, and it fits easily). It also feels really lightweight. For how much coverage this tarp affords, it takes up very little space in my pack. Hummingbird went a little further by using a rolled hem. 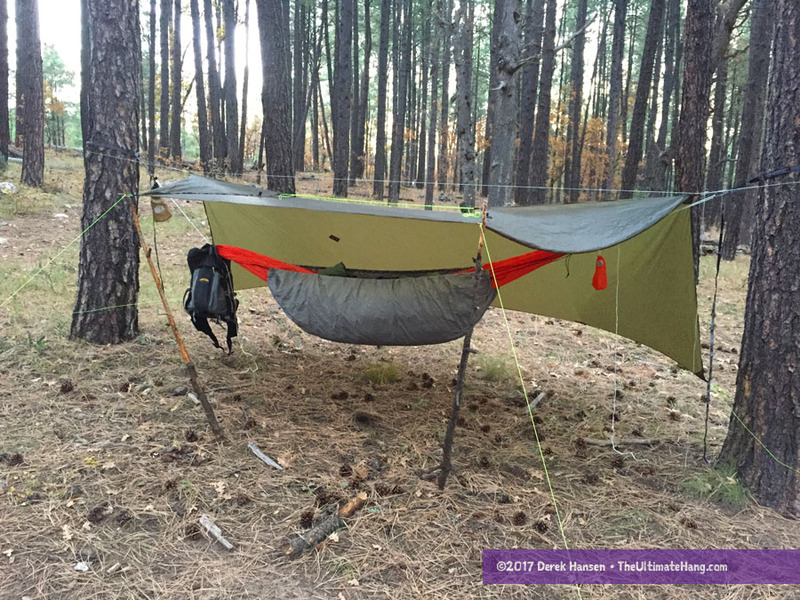 This eliminates a lot of weight than other tarps and helps keep the pack size small. The tarp I was given to review didn’t come seam sealed, so this is one thing I need to go back and fix before I take it in the elements. During one rain storm, I had hoped that the French Seam on the ridgeline would hold up well, but after a while I could see water beading up through the stitching. 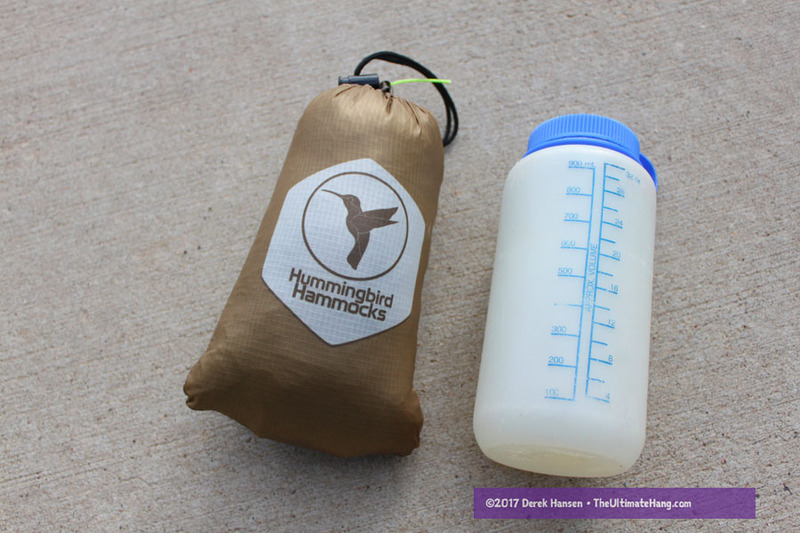 Hummingbird Hammocks offers seam sealing as an extra charge. The guyline kit was included with the tarp I reviewed. The guyline came as one long cord that I had to cut down to equal sizes for all the eight points (I didn’t worry about the ridgeline since I used my own continuous tarp ridgeline). While the guyline is out of the scope of this review, I will say that the cordage is perfectly matched to the tarp (80 ft of super-strong 1.5 mm reflective sleeved Spectra) and four titanium stakes. The whole kit only weighs 3.7 oz (105 g) and fits nicely with the tarp (sans the stakes). This tarp is one I would personally use long-term as it matches my backpacking style. Suspension and Anchor System ♥ ♥ ♥ ♥ ♥ The reflective guyline has tracers and is tough and durable for most uses. I’m glad it includes the titanium stakes as well! Construction and Craftsmanship ♥ ♥ ♥ ♥ ♥ Excellent construction, aimed at the ultralight market. I wish the ridgeline came sealed. Modularity ♥ ♥ ♥ ♥ ♥ A winter tarp with door panels is very modular. The doors can be pulled back out of the way and clipped to each other. Aesthetics ♥ ♥ ♥ ♥ ♥ The kelly green is a good natural color, but there aren’t other options. It blends well for stealth camping. Price and Value ♥ ♥ ♥ ♥ ♥ This is a great price for a cottage vendor tarp with cutting-edge fabrics. Could two hammocks fit under this bunk-bed style?